Generally magnetic beads lose its magnetism as its size becomes smaller, which results in low movement ability. AccuNanoBead™ Magnetic Nanobeads have been developed to obtain the largest surface area while there is still sufficient magnetic force for its mobility. 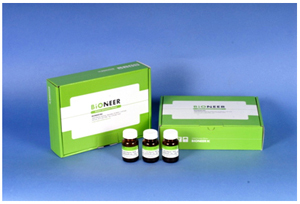 It results in higher binding capacity for target molecule, with less time spent in work. Various functional groups: Coated with silica group, streptavidin, protein G, protein A etc.